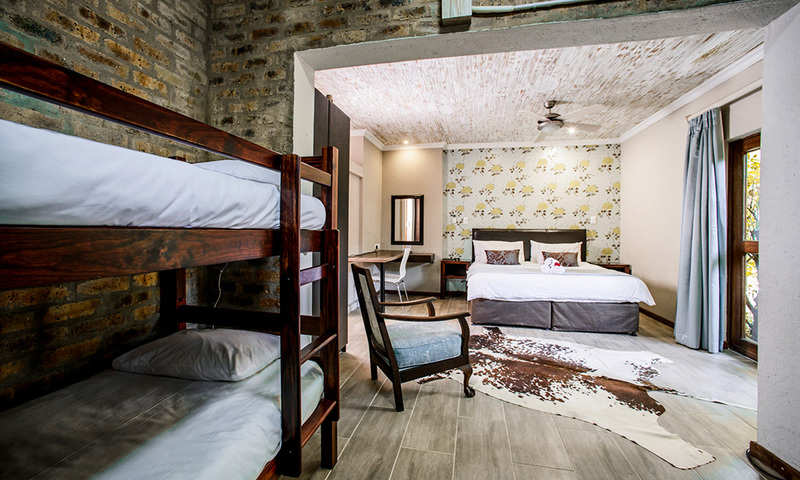 Classic Family Rooms: This is a luxury spacious room with a king size bed, bunk beds for the kids, and a private en-suite bath and shower, microwave, in room coffee / tea facilities and bar fridge. 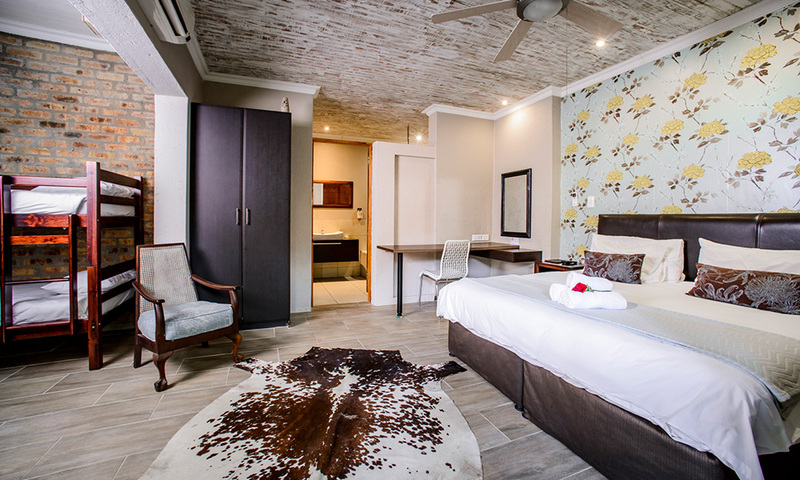 Room is fully air-conditioned, with flat screen TV's and DSTV. It has a working station inside, and a private deck outside. Private entrance with secure parking. 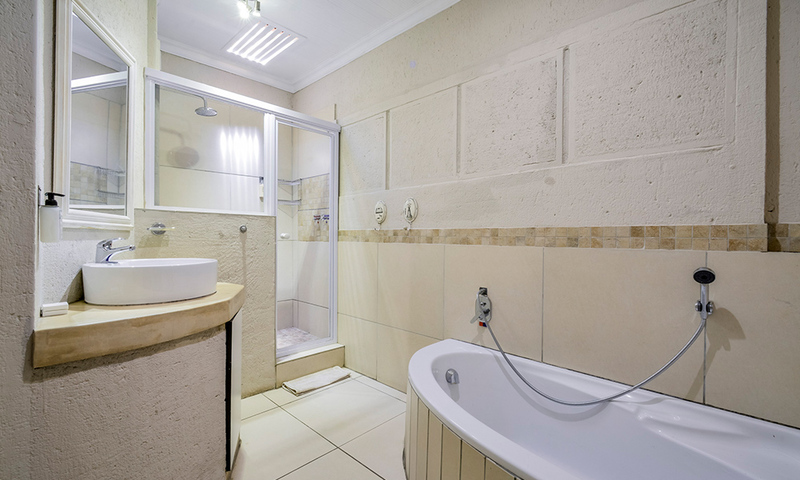 Deluxe family Rooms: This is two adjacent rooms with two entrances and inside inter-leading door, two private en-suite bathrooms (one with a shower and bath, the other shower only). One room has a queen size bed and the other room a double bed and the possibility of a sleeper couch on request. There is a small full kitchen and outside private patio for a barbeque. 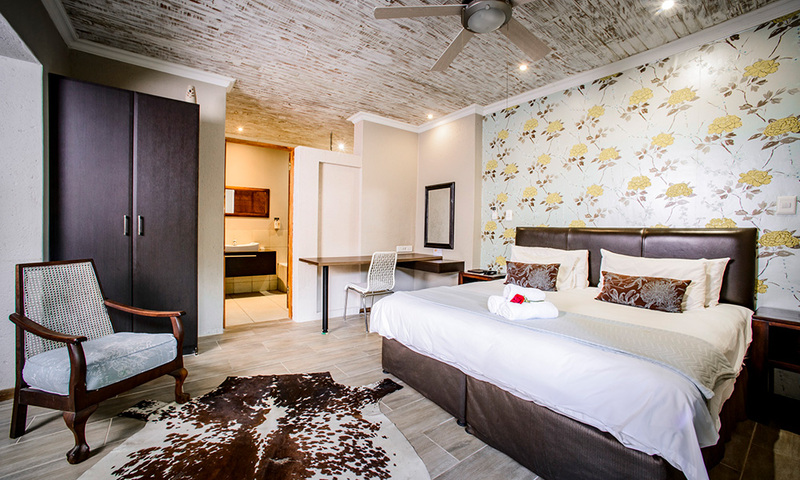 Room is fully air-conditioned, with flat screen TV's and DSTV. We have barbeque facilities, a boma facility (“bos kombuis”), viewing decks, a licensed cash bar on site (wine, beers, ciders, cold drinks only),safe parking, a big treed green garden, a splash pool and complimentary WIFI. All of our rooms has working stations and most of the beds are king size. Some rooms has 2 single beds that can be split and some has double or queen size beds. Please enquire when making your booking. 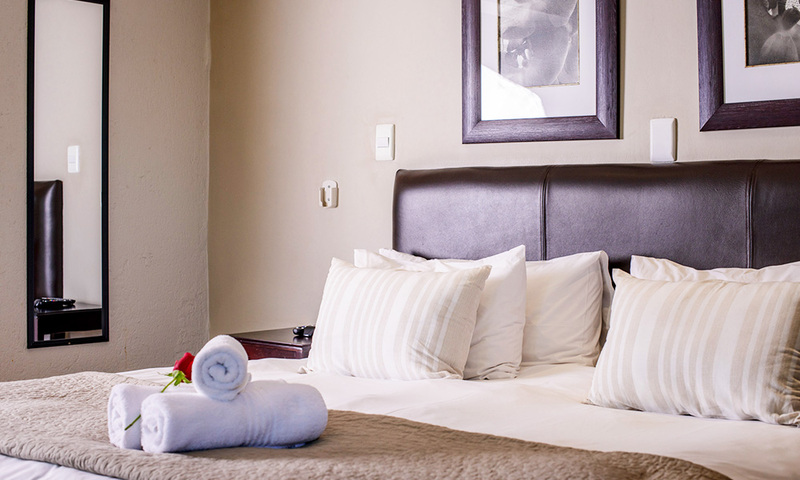 Normal luxury rate per night (R1150.00) + R250.00 per extra adult sleeping on a mattress / sleeper couch. Only 1 extra adult per two adults booking sharing. Dinner R160.00 for a delightfull 2 course meal, OR R185.00 including a drink of choice. Our meals vary weekly - please enquire. We also have a barbeque evening once a week. Dinners have to be pre-booked and arranged. * Please note, while every reasonable precaution has been taken to ensure the safety of our guests and their possessions, the owners, staff or agents of Zebrina Guest house will not be held responsible for damage or loss or injury sustained by guests by whatever cause - ROAR - Right Of Admission Reserved. Check–in time is from 14:00 - 20:00. Please contact us if you would like to arrive outside these hours, so that we can try to accommodate you. Checkout time is before 10:00am on date of departure. Late arrivals after 9:00pm – R100.00 surcharge. All cancellations MUST be in writing to confirm date the of cancellation. Less than 3 working days in advance = 100% of total booking value, less than 7 working days in advance = 50% of total booking value. Less than 14 days in advance = 25% of total booking value. A deposit of 50% of the total booking amount is required upon booking. This deposit will be refunded if cancelled more than three days prior arrival. Full booking balance is due on the day of arrival. Please note that smoking is not permitted in the rooms and inside the lounge area. You may smoke outside your room or in the swimming pool area. * Please note, these rates exclude special events & certain weekends. Minimum booking of 2 - 4 nights over long weekends & events. Please enquire.